December has been a very productive month in Stephanie’s Kitchen Garden. The weather has been very cold, but also dry allowing us to crack on with lots of structural and maintenance jobs. It’s an ideal time of year to make changes to the garden whilst most of it is in its winter dormancy and less likely to be damaged or disturbed. 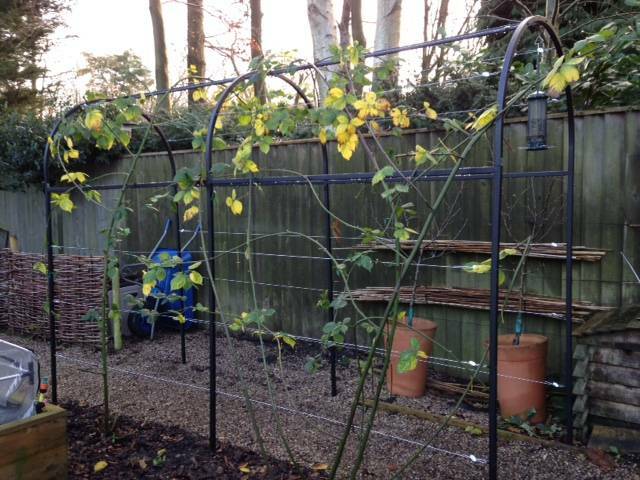 This year our blackberry plants dramatically outgrew their existing supports and we were reluctant to cut them back at the risk of reducing the crop. I chose a linked Roman arch to create a pergola at the back of the Kitchen Garden. This will give the blackberries plenty of room to spread out. Gripple wires on the framework make it easy to neatly tie in the blackberry stems each year. Now the plants can stretch their legs and run, hopefully providing large quantities of fruit along the way. 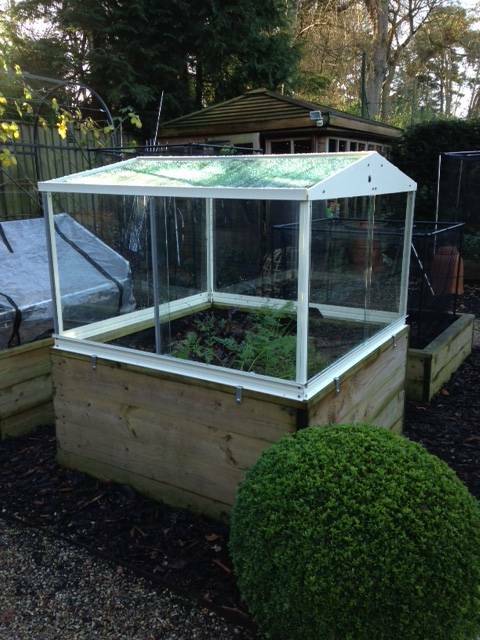 As an early Christmas present to myself, we have also installed a new cold frame over our standard raised beds this month. Jo spent a day putting it together and I am sure you will agree that it looks amazing. A beautiful addition to any garden. Currently it is housing some late carrots that are soon to be harvested for Christmas lunch. Early in the month we treated all our fruit trees to a winter wash. Once the leaves have all fallen from the trees, a winter wash spray will rake care of any pests looking to hibernate in the branches. We will apply it again in the spring. I would point out that this is a particularly smelly job. Last time I applied it I made a diary note to make sure that in future it was my last job of the day before heading for the shower! On a particularly cold December day, I retreated to the potting shed, turned on the heater and spent a couple of hours sorting through our seed tin. Out of date packets were discarded and a list drawn up of what we need for 2015. Then it was time for a hot cup of tea and a perusal of the seed catalogues. We have some varieties that we use year on year as they always perform well for us here; such as Parsnip ‘Tender and True’ and broad bean ‘Aquadulce’. Amonsgt these stalwarts, I’ve also added some new varieties of vegetables to try for the first time next year. I can’t wait. In the meantime, the job of cleaning pots and tools has begun. We haven’t made much headway with this so far as we’re saving it for rainy days and there haven’t been many of these this month. It will be an ideal job for the dark cold days of January. The final job in December is to enjoy a well deserved rest from the toil in the winter garden. Time to put your feet up and indulge before venturing back into the garden in the New Year. That’s the plan, but I’m sure that come Boxing Day morning, my wellies will be calling me! 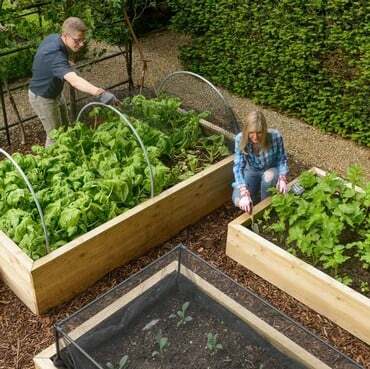 • Dig over bare soil and add compost or manure. • Clear any leaves or debris from the ground. • Continue cleaning pots and tools. Our 100-page Autumn catalogue is out now and it's packed full of gardening ideas and products to solve the problems every gardener faces, plus plenty more seasonal ideas for harvesting, storage and preserving solutions.